Your child deserves a Catholic Education. Our school offers rigorous academic curriculum in a smaller, more personal environment. Your child is not just a number, they are a person that will grown into a successful adult with the right educational environment. Call us today. Car + Home = Big Savings! Call Today. Welcome to Holy Trinity Catholic School. We are a Catholic elementary school located in Our Lady Star of the Sea Parish in North Myrtle Beach, South Carolina. Our school was founded in 2009 and presently enrolls students in Grades K3 through 8. Our goal at Holy Trinity Catholic School is to develop the spiritual, academic, personal, creative, and physical growth of each student within an atmosphere of care and concern. The school is committed to its Catholic heritage while being open to families of all faiths and backgrounds.Students participate in the Liturgy on Wednesday mornings, begin and end each day with prayer, celebrate the various seasons of the Church’s year as well as the major feasts of the Church. We are also committed to academic excellence through the use of a challenging curriculum, state of the art technology and classes in Art, Music, Library, Physical Education, Spanish, Technology and other exploratory classes. We hope that our academic program serves as a means of promoting life-long learners. Please visit us through this website or in person! We would love to have the opportunity to welcome you to our campus and show you that Holy Trinity Catholic School is a truly special place. 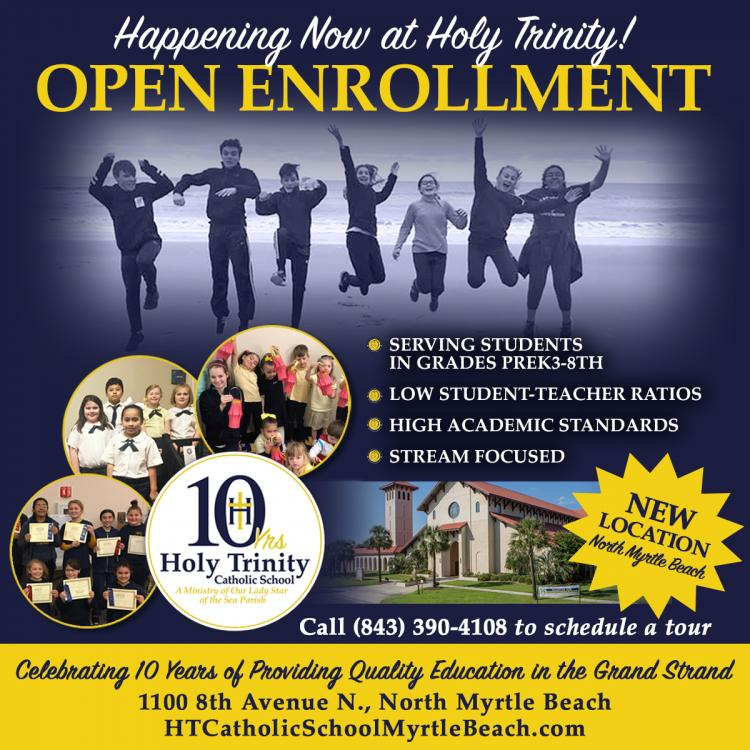 Holy Trinity Catholic School, a ministry of Our Lady Star of the Sea Parish, offers to elementary and middle school students of diverse ethnic, economic and religious backgrounds a superior academic program based on Gospel values. Within a family atmosphere, the school strives to develop the spiritual, academic, personal, creative and physical growth of each student. Holy Trinity Catholic School students will be fully prepared to transition to high school possessing critical thinking skills, an ability to work independently as well as collaboratively, and an awareness of what it means to actively live the Gospel values.